Following a tradition that Pixar set with A Bug's Life, Brave 3D is preceded by a short animation film, La Luna. In this, a young boy accompanies his father and grandfather on a boat to the middle of a lake, waits for the moon to rise, and then cleans it (the moon) of all the stars that have crashed into it. As far as Pixar shorts go, this one is by far the most poetic, surreal, and fascinating. Unfortunately, the same cannot be said of Brave, which, at 93 minutes, seems much longer than it actually is. Merida (Kelly MacDonald) is a Scottish princess, with a perfect life and an even more perfect family. Her father, King Fergus (Billy Connolly), is the heroic survivor of a bear attack, and is also extremely indulgent towards his daughter. The only bane, if at all, in her existence is her mother, Queen Elinor (Emma Thompson), who constantly reminds Merida that she needs to behave like a lady instead of perfecting her archery and climbing steep cliffs. Although the free-spirited Merida loves her mother, she loses her temper when Elinor arranges for the regent princes of their allies - 3 clans - to stake their claim on the princess by proving their competence in a sport of Merida's choice (archery, naturally). Merida rides into the forest, and chances upon a witch's (Julie Walters) cottage. In an attempt to teach her mother a lesson, Merida buys a spell to put a stop to the constant nagging. The spell works, leading to a disaster, and Merida spends the rest of the time in the movie running around in the forest and in the palace, to undo the tragedy. It is a race against time, and unless she can decode the reversible spell, her life will see a drastic change. This is probably the first time that a heroine-oriented animation from Disney has nothing to do with the girl finding her one true love (think Snow White, Sleeping Beauty, and, more recently, Tangled). It is also the first time that the heroine/princess has to deal with her mother and not a cruel step-mother. Brave has rebellion against society's norms, a teenage girl's angst against her mother, and also the underlying theme of how easy it is to give in to the animal inside you. 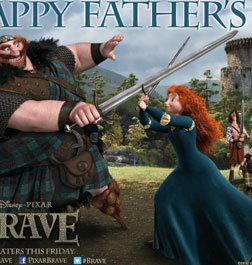 So yes, Brave is a pioneer in more ways than one, as far as screenplays go. The problem is the lack of depth in the characterisation and the plot. At no point do you feel strongly for Merida, or even Elinor. The mother-and-daughter scenes will not bring a lump to your throat like, say, the father-son sequences of Finding Nemo or The Lion King. Of course, the story has a moral (love your parents unconditionally? ), but unlike the above-mentioned movies, it does not come across with emotion or sentiment. Visually, of course, there is not much that can outdo the Pixar-Disney combination. Production design is slightly limited, however - locations are limited to the castle, the forest, and the clearing. Again, unlike the recent Tangled, there is not much detailing in either costumes or production design. Nor is there much action, making the 3D redundant, except in the will-o'-the-wisp scenes. Given the inevitable lack of an emotional connect between the movie and the audience, you may find the actors a tad flat. Kelly MacDonald modulates her voice in all the wrong places, sounding hysterical at times. Emma Thompson is unusually dull in the poignant scenes, but does a good job as the somewhat strict mother. Billy Connolly carries off the hearty voice of a Scottish king who loves his food and his hunting, and makes King Fergus the most endearing of the lot. If you have to take your kids to a showing of Brave, do not expect them to love the movie just because there are cute characters and because it is an animation. Watch it only if you admire Pixar and Disney, and all that they have achieved over the years. And avoid the 3D version - the 2D version is just as appealing. Be the first to comment on Brave (3D)! Just use the simple form below. fullhyd.com has 700,000+ monthly visits. Tell Hyderabad what you feel about Brave (3D)!